The Itty Bitty Kitty Committee: Wylla Claus (or Claws!) is Coming to Town! Wylla Claus (or Claws!) is Coming to Town! Well, this was supposed to be yesterday afternoon, but our internet went out which prevented this post from happening. Things are choppy today, but hopefully, I'll be able to get the post written and pictures up before it goes down again! ANYWAY, I'm here to share with you these hot-off-the-press Christmas card featuring dear Wylla sporting a Santa Claus (or Santa Claws) beard and hat. Bless that tolerant cat! 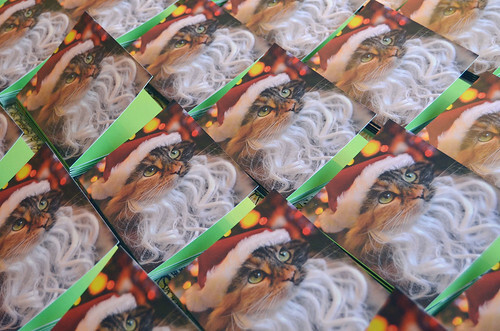 The cards measure 4.25" x 5.5" and they're printed on a heavy cardstock. The exterior has a glossy finish and inside it's a matte finish. 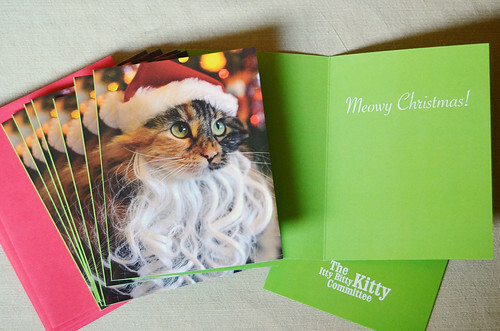 "Meowy Christmas" is the message inside. They're packed in sets of 10 and come with coordinating "holiday red" envelopes. We're offering a bulk discount, and if you order three sets or more and enter the code "SANTA" upon checkout, you'll receive 15% off the cards. I know Christmas is coming up fast, so we'll be shipping daily (except Sundays). The cards are all packed up and ready to go, so if you order in the morning, they'll go out that afternoon! Quantities on Sparkle Balls is getting low and I'm waiting on a new shipment. As soon as they arrive, I'll be adding them to the shop. We'll have lots of wintery mixes and holiday colors coming! To visit the shop, please click HERE. Or, go straight to the Christmas cards by clicking HERE! i was wondering when these would come out. 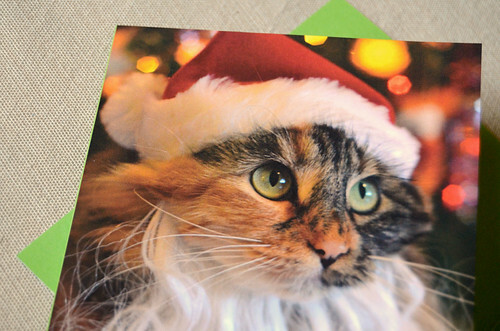 i send your cards every year and they are a huge hit! I'd love to see Wylla Paws coming down my chimney!